Hamish Rutherford’s half-ton couldn’t prevent Derbyshire from falling to defeat at home to Yorkshire in a rain-affected Royal London One-Day Cup game. Gary Ballance eased his England disappointment by inspiring Yorkshire to victory. 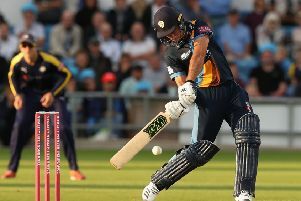 He top-scored with 69 as Yorkshire posted 239-6 from 42 overs and although Rutherford replied with a 44-ball 56, Derbyshire fell short of a revised target of 197 from 29 overs to lose the game by seven runs under Duckworth-Lewis. Rain delayed the start by 90 minutes and it was no surprise when Alex Lees mistimed a pull to mid on and although Glenn Maxwell straight drove Shiv Thakor for six, he again failed to build on a promising start and flicked Alex Hughes into the hands of deep mid-wicket in the 15th over. Mark Footitt removed Andrew Gale lbw to leave Yorkshire 91-3 after 21 overs but Ballance and Jack Leaning provided the momentum by adding 83. Leaning eventually went when a top-edged hook went to long leg, but Ballance added 36 from 25 balls with Tim Bresnan before a superb one-handed diving catch by Hughes removed the latter. Ballance was caught behind with two overs left but Liam Plunkett’s unbeaten 17 from 12 balls took Yorkshire to a competitive total before rain left Derbyshire chasing a revised target. Godleman drove and pulled Jack Brooks for two fours from the first over but Wes Durston was then caught by Ballance. Ballance then dropped Wayne Madsen at point on nine before the home skipper was eventually bowled attempting a ramp. Derbyshire suffered another setback when Godleman was caught behind trying to drive Plunkett. A mix-up with Rutherford saw Thakor needlessly run out but 11 came from the 17th over and Rutherford raised Derbyshire’s hopes by pulling Will Rhodes for six. Maxwell took a stunning one-handed diving catch at point to remove Hughes and although Rutherford drove the Australian for six, Derbyshire’s hopes ended when the New Zealand man holed out to long off for 56 in the penultimate over.